Come see me in a staged reading of this wonderful show. On a cold, clear, moonless night in the middle of winter, all is not quite what it seems in the remote, mythical town of Almost, Maine. As the northern lights hover in the star-filled sky above, Almost’s residents find themselves falling in and out of love in unexpected and often hilarious ways. Knees are bruised. Hearts are broken. But the bruises heal, and the hearts mend—almost—in this delightful midwinter night’s dream. “ALMOST, MAINE is a series of nine amiably absurdist vignettes about love, with a touch of good-natured magic realism…witty, romantic, unsentimental. A beautifully structured play, with nifty surprise endings (most but not all of them happy).” —The New York Times. “Sweet, poignant, and witty. Nearly perfect. AMOST, MAINE’s charm is real. It packs wit, earns its laughs and, like love, surprises you.” —New York Daily News. “Mega-hit ALMOST, MAINE lands somewhere between Norman Rockwell and Our Town. Unlike traditional play readings with a group of seated actors simply reading the script aloud, this staged reading features a set, costumes, action, lighting, music and sound effects. Mild adult language and themes. 2016 has passed and I was very blessed to have worked pretty regularly on stage and television. It’s weird, but in this profession you can have a period of time where you work consistently and then a period of time where you wonder if you will ever book another gig. 2016 was a great year for theater, I was in 4 productions and it was the first time I had to play multiple characters in one show. A different and challenging experience that taught me so much about myself and my craft. On the TV front, I did commercials and got to practice and hone the skills that you need for TV and film which I find to be quite different than theater. I took on two new endeavors my mere chance. In 2016 I started to really delve into and practice Improv. Who knows, maybe 2017 will be the year I actually perform Improv in front of an audience. The 2nd endeavor was the opportunity to voice the audio tour for the Frida Kahlo Exhibit at the Dali Museum. A pleasure and honor that words cannot express to do this audio tour about a woman that I admire so much. All in all, I was blessed. Already starting 2017 in two staged readings and keeping myself open to whatever roles may came. Happy New Year everyone and if you want to see what I’m doing this year, don’t hesitate to visit my website and/or any of my other social media pages. 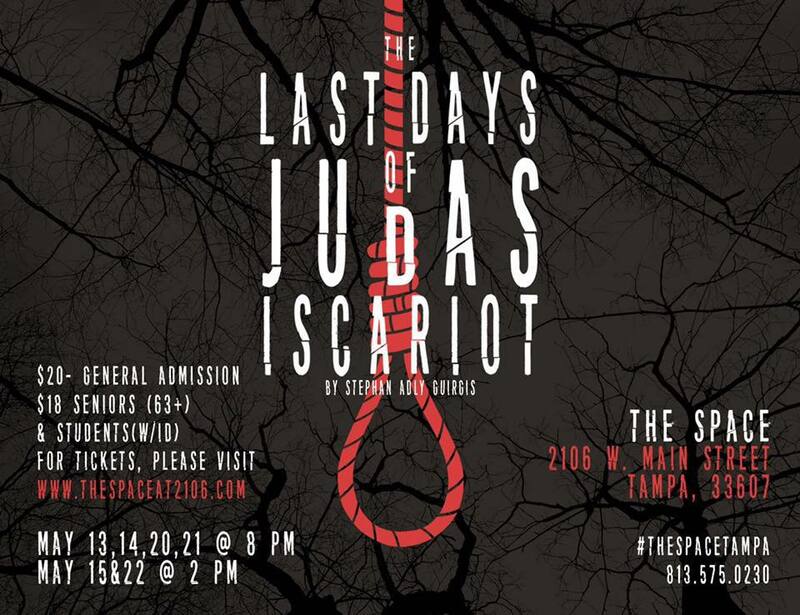 The Last Days of Judas Iscariot has been praised as a “profound and wildly entertaining” comedy since it premiered ten years ago. Set in a time-bending world between heaven and hell, this darkly comic piece tells the story of Judas Iscariot as a trial is set to determine his ultimate fate. Lawyers and saints are pitted against each other as they delve into Judas’ childhood and call for the testimonies of Mother Teresa, Caiaphas, Saint Monica, Sigmund Freud, and even Satan.